The period May 1 to the turn of the month of November (last five trading days October) has historically produced negligible returns. The rest of the year (late October to the end of April) has essentially all the year's gains. 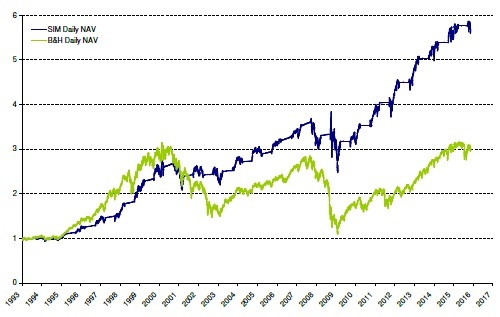 In this paper we show that there is a statistically significant difference and conclude that the strategy go to cash in the weak period and go long in the strong period has about double the returns of buy and hold for large cap S&P500 index and triple for the small cap Russell2000 index during the period 1993-2015 in the index futures markets. ffect, is one such strategy that is often discussed in the financial press. ffects depending upon market conditions." The existence of risk premia has been widely documented in the academic literature over the past decades. Until now they have typically been handled as separate phenomena for specific markets or asset classes and thus examined independently. This study analyses risk premia across a variety of asset classes and risk styles to uncover their common performance characteristics, underlying risk sources and return’s sensitivity to economic factors. Based on a set of 16 risk premia over a 22 year sample period we were able to illustrate that risk premia’s expected returns are significantly influenced by their volatility and their sensitivity to funding liquidity and market volatility. Furthermore we show that macroeconomic factors such as industrial production and inflation have a significant effect on the expected returns of the entire set of risk premia. Finally, analysing the link between premia and the global market portfolio shows that premia with unfavourable comoments possess superior expected returns. "This study initiates with the analysis of return characteristics for 16 risk premia over a 22 year sample period. We show that the expected return of a risk premium is significantly affected by its volatility. In other words, higher risk premia volatilities go hand in hand with higher expected returns. 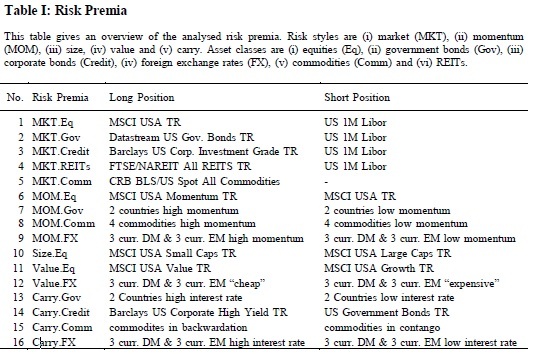 However, the analysis of risk premia’s skewnesses and kurtoses does not provide significant results. Subsequently, we build a global cross-asset market portfolio and analyse how risk premia comoments determine their expected returns. The idea behind this is that investors are not compensated for diversifiable risk in equilibrium, but for their systematic risk exposure. The results are in line with the efficient market hypothesis and show that risk premia when adding positive cokurtosis or negative coskewness to a diversified market portfolio have significantly higher expected returns. However, we do not find significant results for a risk premium’s beta exposure to the global cross-asset market portfolio. The second part of the analysis studies the relevance of economic conditions affecting risk premia returns. Considered factors are change in industrial production and inflation, market volatility and market- and funding liquidity. We start with a regime analysis which documents considerable differences in a risk premia’s return given subject to economic conditions. Comparing risk premia over different regime classifications, this analysis shows the intuitive result that the risk premium “government market” generates attractive returns during unfavourable market regimes and serves as a “safe haven” investment. However, it is not the only risk premium with higher returns during unfavourable periods. For example “commodity momentum” and “FX value” also generate attractive returns during unfavourable market conditions. Afterwards we analyse the expected return of risk premia contingent on each of the economic conditions. We see that during periods of high industrial production changes and low inflation changes, risk premia per se possess higher expected returns. This is also true during periods of high funding liquidity. This study concludes with an analysis of how risk premia’s expected returns are linked to their sensitivities to economic factors. We show that risk premia with higher sensitivities to funding liquidity and market volatility possess significantly higher expected returns." The current study examines the turn of the month effect on stock returns in 20 countries. This will allow us to explore whether the seasonal patterns usually found in global data; America, Australia, Europe and Asia. Ordinary Least Squares (OLS) is problematic as it leads to unreliable estimations; because of the autocorrelation and Autoregressive Conditional Heteroskedasticity (ARCH) effects existence. For this reason Generalized GARCH models are estimated. Two approaches are followed. The first is the symmetric Generalized ARCH (1,1) model. However, previous studies found that volatility tends to increase more when the stock market index decreases than when the stock market index increases by the same amount. In addition there is higher seasonality in volatility rather on average returns. For this reason the Periodic-GARCH (1,1) is estimated. The findings support the persistence of the specific calendar effect in 19 out of 20 countries examined. The purpose of this paper is to investigate the turn of the month effect in stock market indices around the globe and to test its pattern, which can be used for the optimum asset allocation with result the maximization of profits. Because each stock market behaves differently and presents different turn of the month effect patterns, the trading strategy should be formed in this way where the buy and sell signals and actions will be varied in each stock market index. Haugen and Jorion (1996) suggested that calendar effects should not be long lasting, as market participants can learn from past experience. Hence, if the turn of the month effect exists, trading based on exploiting this calendar anomaly pattern of returns should yield extraordinary profits – at least for a short time. Yet such trading strategies affect the market in that further profits should not be possible: the calendar effect should break down. However, the results show that the turn of the month effect is persistent in 19 out of 20 stock market indices during the whole period examined. Moreover, sub-sample periods have been explored too supporting the same concluding remarks. In addition, when the post financial crisis period sample 2010-2013 is excluded from the analysis, the turn of the month effect is present in all stock market indices." "To study the asset selection by private equity funds, author assembles a dataset of public-to-private transactions sponsored by financial buyers, similar to the approach used by Axelson, Jenkinson, Strömberg, and Weisbach (2013). A selection model finds that private equity investors consistently tend to target relatively small firms with low operating cash flow multiples. Additionally, the selected firms tend to be value firms. Interestingly, a firm’s market beta is not a reliable predictor of whether a firm is selected for a going-private transaction. In fact, the average pre-transaction market beta for the public-to-private firms is 1. In light of the evidence on the importance of return smoothing in altering the measured risk properties of hedge fund returns, special attention is focused on whether the strikingly attractive risk properties of the aggregate PE index could be due to the return reporting process. To investigate how the reporting process can alter inferences about risks, two different accounting schemes are used to report portfolio net asset values from which periodic returns are calculated. The first is the traditional market-value based rule where all holdings are reported at their closing price. Portfolios comprised of stocks with market betas averaging 1, with portfolio leverage of 2x, have measured portfolio betas near 2 under the market-value based accounting rule. The second accounting scheme is based on a hold-to-maturity rule, whereby securities that are intended to be held for long periods of time are measured at cost until they are sold. Over periods where security valuations are increasing on average, this accounting scheme appears to provide a conservative estimate of portfolio value and therefore will perhaps understate leverage. However, an additional feature of this accounting scheme is that it significantly distorts portfolio risk measures by recognizing the profits and losses on the underlying holdings only at the time of sale. Consequently, portfolios with highly statistically significant measured betas near 2 under the market-value reporting rule have measured beta that are statistically indistinguishable from zero under the hold-to-maturity reporting rule. This suggests that the long holding periods of private equity portfolios, combined with conservativism in measuring asset values can effectively eliminate a majority of the measured risk. Overall, the results push against the view that private equity adds value relative to passive portfolios of similarly selected public equites. The mean returns can be matched in a variety of ways in passive portfolios with firms sharing the characteristics of those selected for private equity portfolios. The critical difference appears to be in the marking of the portfolios and the resulting estimates of portfolio risk. A strategy that simply selects low EBITDA multiple firms and rebalances to equal-weights each month will match the mean reported private equity return before fees. 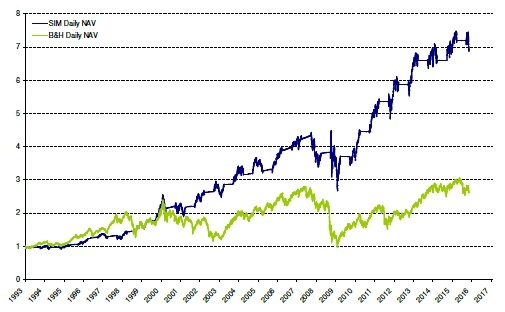 This portfolio is tilted towards small firms relative to a value-weighted portfolio and consists only of value firms, two characteristics that are both related to subsequent returns and to the empirical selection criterion that appears to be used when publicly traded firms are targeted by private equity investors. Interestingly, this portfolio does not make use of leverage to match the mean private equity return. A popular belief about private equity is summarized in the following anonymous quote: “there are some things you simply cannot do as a public firm that you can do as a private firm.” This is likely to be true. Firms are likely to benefit from the active operating and financial management provided by private equity investors. At the same time, it appears that private equity investors overpay for the opportunity to provide these services. The private equity structure – here viewed to be the combination of a value stock selection criterion, long holding periods, conservative net asset value accounting, and active management at the portfolio companies, including increased leverage – can mostly be reproduced with a passive portfolio strategy." We have launched a new portal Quantconferences.com - a brand new directory for quantitative finance and algorithmic trading conferences. You are most welcome to visit our new project. Let us know if you are missing any event in our list and we will add it there.